Most high school marching bands would jump at the chance to perform in their state's largest and best-known parade, especially if the event is geographically nearby. However, the band from Colony High School has no desire to march in the Iditarod Parade. That's "Iditarod"...as in the dogsled race...through blizzard conditions...in sub-zero temperatures...in Alaska. Well, might any other marching bands in the state be willing to brave the elements to perform at the event? Okay, that's a trick question: There are no other active marching bands in the state of Alaska. It's not that the 47 members of the Colony High School Marching Band aren't hardy souls. The band performs at football games thatby the end of the regular seasontake place while ice develops on the field. By the time of the state football playoffs, the band members must constantly blow air through their horns and keep the valves moving, lest the instruments totally freeze up and become unplayable. According to director Jamin Burton, "You get used to it. By the middle of winter, a 30-degree day feels absolutely warm." As a native of Utah and a student at Brigham Young University, director Burton loved marching band. And so, it was natural that he ended up in Alaska. Okay...not really. When asked how he found himself teaching in Alaska, he replied, "I'm not exactly sure." 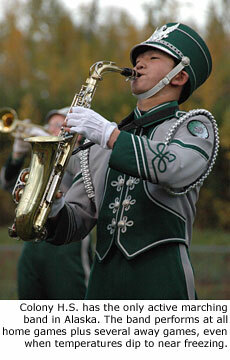 That first year, the marching band performed in t-shirts and jeans, with begged and borrowed instruments. Uniforms were purchased the following year, and by the year after that, the band started to develop its own traditions. The band performs three field shows a year and annually puts together a combined piece with the school's cheerleaders, who have become the band's biggest supporters. The cheerleaders were influential in creating a bridge between the student body and the marching band, helping the ensemble develop its identity and earn the respect of the student body. Junior Lily Coyle is a member of Colony's cheerleading squad. She states that having the marching band present is a big help in getting the crowd involved in the game, adding, "Cheering just wouldn't be the same." The enthusiasm of the cheerleaders for the band and the band members for the cheerleaders has introduced a massive degree of teamwork between the two groups, combining to elevate school spirit. Besides playing at all four Colony High School home football games, the band also travels to away games. This doesn't usually present much of a logistical problem, as most away games are in or near Anchorage. (The state's largest city is about 50 miles south of the school's location between the towns of Wasilla and Palmer.) But one game was in Fairbanks, 350 miles north of the school. The band went up there by bus, a seven-hour one-way trip. In 2006, the band succeeded in raising enough money to participate in the National Independence Day Parade in Washington, DC. They practiced marching through the halls of the school during the winter months and got acclimated for the oft-stifling DC summer weather by wearing their coats and hats while practicing during the warmer months. Jamin and the rest of the band would love to march the upcoming Presidential Inaugural Parade, but major sponsorships would have to be secured for that to happen. Alaska has had only one band march in such a parade, and that was back in January of 1977, for the Jimmy Carter inauguration. That band never did march again. 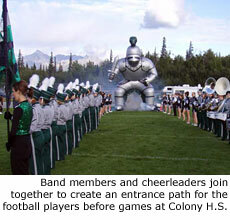 The Colony High School Band is also planning a trip to the 2010 Sugar Bowl in New Orleans. While the band has generated a lot of positive response from the community, out-of-town media and other band directors have expressed amazement that there is an active marching band in Alaska, largely due to a lack of comprehension of the abundant marching band tradition in the "lower 48." Still, the success of the band in producing publicity and school spirit has led other band directors to inquire about the possibility of starting up marching bands of their own. According to Jamin, "The tradition we have been able to create in a short time is awesome." With a great deal of support and teamwork from the cheerleaders, Jamin Burton and the marching band members of Colony High School have succeeded in blazing a trail through the wilderness of Alaska's barren marching band tundra. Michael Boo is the staff writer for Drum Corps International and writes extensively for other pageantry organizations, including Bands of America and Winter Guard International. His contributions to these various activities have earned him the nickname, "The Pen of Pageantry." Photos courtesy of Colony High School Band.